Stratford's community organization, Reestablishing Stratford brightens up the community's archway thanks to a donation from Adventist Health. Reestablishing Stratford is at it, again. A pair of its members, Robert Isquierdo and Ramon Chavez, are helping to bring a little Christmas spirit to the small Kings County town – and send a message about working together to build a better community. The two convinced Adventist Health to donate trees lights and then decorated the gateway that beckons visitors to the community. They said the decorated arches are designed to create awareness of the existence of Reestablishing Stratford and the need for community improvement through involvement. 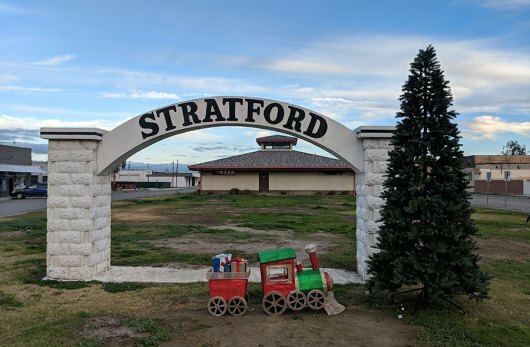 “The hope is that these decorations will serve as a visual example of how an organization and a community can work together to improve and beautify Stratford,” said Isquierdo. Isquierdo is also one of the founders of Reestablishing Stratford, a non-profit organization that hopes to bring positive change to the small Kings County community. The goal is to break the cycle of negative activities associated with the rural town by offering positive alternative activities and services that inspire hope. The project was started by Stratford residents Isquierdo and Chavez, both of whom see a bright future for their tiny community. The two got together a few years ago, and with others created Reestablishing Stratford. They and their Board have lofty goals, like creating a community center and providing positive events, resources, and services for all Stratford residents. The other goals are equally as lofty: They want a sports complex, an ESL program for adults, more positive community events, a community garden, sports programs, a leadership programs to develop young leaders.